In the 1960s, sociologist John McKnight coined the term "redlining" to describe the discriminatory practice of fencing off areas where banks would avoid investments based on community demographics. During the heyday of redlining, the areas most frequently discriminated against were black inner city neighborhoods. For example, in Atlanta in the 1980s, a Pulitzer Prize-winning series of articles by investigative reporter Bill Dedman showed that banks would often lend to lower-income whites but not to middle-income or upper-income blacks. The use of blacklists is a related mechanism also used by redliners to keep track of groups, areas, and people that the discriminating party feels should be denied business or aid or other transactions. In the academic literature, redlining falls under the broader category of credit rationing. 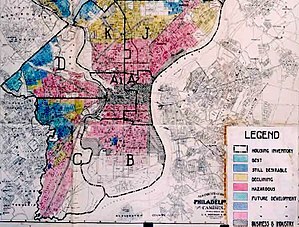 The practice of redlining actively helped to create what is now known as the Black - White wealth gap seen in the United States today. Wealth is what provides/allows opportunity for the American Family. A family can survive on an income alone but wealth is what provides for economic mobility, financial security, and inheritance. This primary difference is what works to set apart people of color (in particular black Americans) and affluent white Americans. Unfortunately, wealth is unevenly distributed on a basis of race, a process then can be traced back to times of slavery, allowing whites to profit off bodies of an enslaved people, who were not allowed to live freely or build wealth. Other laws and policies may have also contributed to the Black - White wealth gap including Jim crow, prison-industrial complex and mass incarceration, which prohibited people of color from having the same liberties as their white counterparts. Studies show that Black families in America earn just $57.30 for every $100 in income earned by white families, according to the Census Bureau's Current Population Survey. For every $100 in white family wealth, black families hold just $5.04. In 2016, the median wealth for black and Hispanic families was $17,600 and $20,700, respectively, compared with white families' median wealth of $171,000. The black-white wealth gap has not recovered from the Great Recession. In 2007, immediately before the Great Recession, the median wealth of blacks was nearly 14 percent that of whites. Although black wealth increased at a faster rate than white wealth in 2016, blacks still owned less than 10 percent of whites' wealth at the median. A 2012 study by the Wall Street Journal found that Staples, Home Depot, Rosetta Stone and some other online retailers displayed different prices to customers in different locations (distinct from shipping prices). Staples based discounts on proximity to competitors like OfficeMax and Office Depot. This generally resulted in higher prices for customers in more rural areas, who were on average less wealthy than customers seeing lower prices. Reverse redlining occurs when a lender or insurer particularly targets minority consumers, not to deny them loans or insurance, but to charge them more than would be charged to a similarly situated white consumer, specifically marketing the most expensive and onerous loan products. These communities had largely been ignored by most lenders just a couple of decades earlier. In the 2000s some financial institutions considered black communities as suitable for subprime mortgages. Wells Fargo partnered with churches in black communities, where the pastor would deliver "wealth building" seminars in their sermons, and the bank would make a donation to the church in return for every new mortgage application. Working-class blacks wanted a part of the nation's home-owning trend. Instead of contributing to homeownership and community progress, predatory lending practices through reverse redlining stripped the equity homeowners struggled to build and drained the wealth of those communities for the enrichment of financial firms. The growth of subprime lending (higher cost loans to borrowers with flaws on their credit records) prior to the 2008 financial crisis, coupled with growing law enforcement activity in those areas, clearly showed a surge in a range of manipulative practices. Not all subprime loans were predatory, but virtually all predatory loans were subprime. Some subprime loans certainly benefit high-risk borrowers who would not qualify for conventional, prime loans. Predatory loans, however, charge unreasonably higher rates and fees by compared to the risk, trapping homeowners in unaffordable debt and often costing them their homes and life savings. This act was designed to increase the availability of credit and financial services to lower income and minority borrowers and their communities and to improve on the ways that depository institutions approach lending in these communities. Although not Ill intended, this act ended up creating first known methods of segregation that are still active today. These active lines of discrimination are still prevalent. Redlining set the grounds for what became known as Ethnic Enclaves, closed off pockets of land that were provided with less financial resources and seen to have little to no monetary value. ^ Romley, John A.; Cohen, Deborah; et al. (January 2007). Schuckit, Mark A. (ed.). "Alcohol and Environmental Justice:The Density of Liquor Stores and Bars in Urban Neighborhoods in the United States" (PDF). Journal of Studies on Alcohol and Drugs. 68 (1): 48–55. doi:10.15288/jsad.2007.68.48. PMID 17149517. Retrieved 14 March 2015 – via RAND Corporation. ^ Taylor, Astra; Sadowski, Jathan (2015-05-27). "How Companies Turn Your Facebook Activity Into a Credit Score". ISSN 0027-8378. Retrieved 2019-03-31.